A new exhibit is now in the display case. 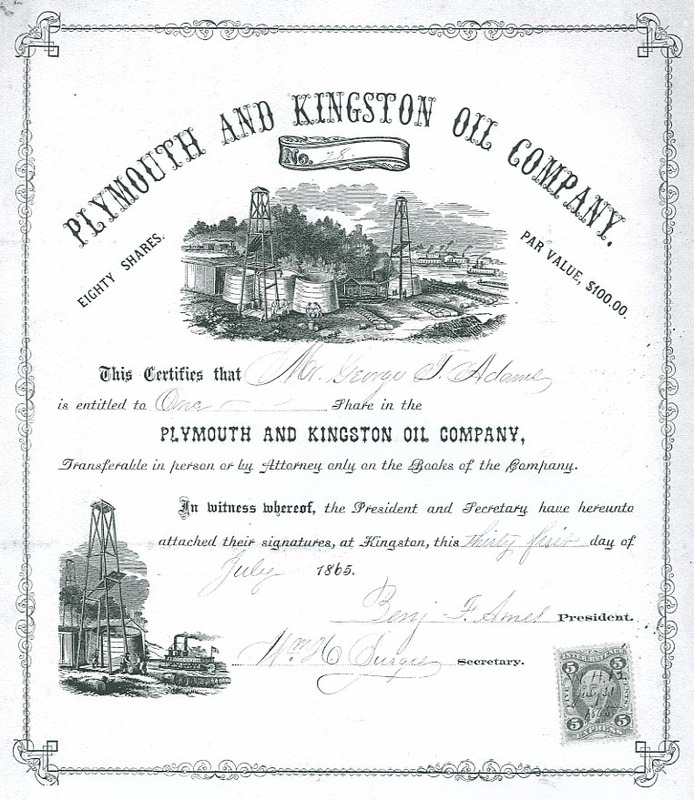 “Taking Stock — Kingston Investments in the 19th Century” shows a century of local and national stock certificates and related business ephemera. One of the local items is particularly intriguing. Little can be found about this early corporation. The named individuals can be identified. The owner of the shares was George T. Adams, brother of Kingston’s library benefactor Frederic C. Adams. The president of the company was Benjamin F. Ames, listed in vital records as a Kingston merchant in 1848. Secretary William H. Burges was a well known Kingston shopkeeper (first at Burges & Bailey, then Burges & Keith and finally under his own name alone), Town official (treasurer, tax collector, and town clerk) and state representative. The company, however, remains shrouded in some mystery. The derricks and refineries in the engravings point to petroleum, rather than the whale oil that dominated southeastern Massachusetts in the 19th century. The date 1865 fixes the company at the very beginning of the modern oil industry. The processes of distilling kerosene — first from coal, then from “seep oil” — had been discovered in the late 1840s . The first oil well had been drilled in Titusville, PA, in 1859, and John D. Rockefeller had entered the oil business in 1863 with a refinery in Cleveland. Beyond these clues drawn from the face of the document, there are more questions than answers, as often happens with historical ephemera. How long did the company last? What exactly did they do? Is there any way to find out more? Inquiring minds always want to know.